- Tectonics of the Kopet Dagh and the surrounding regions. - The Alpide belt (Alpine geosynclinal belt). - Seismicity of the Kopet Dagh region. 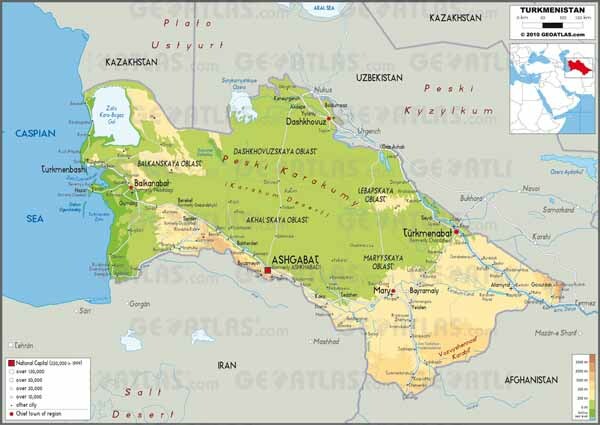 Turkmenistan physical map. Completely destroyed Ashgabad city after the earthquake. 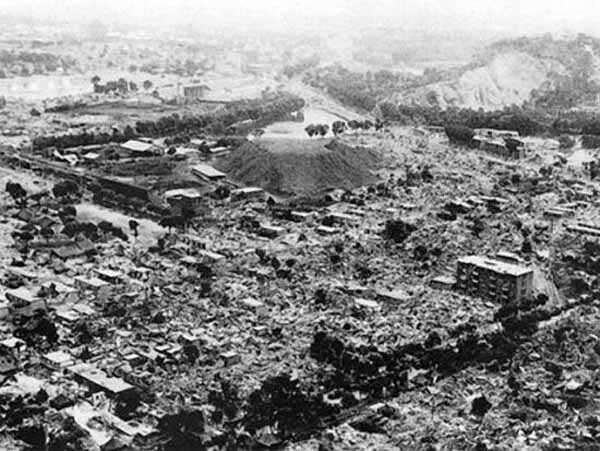 One of the most devastating earthquakes in the past century - the 1948 Ashgabat earthquake - occurred 2:17 in the morning on 6 October 1948. The epicenter of the earthquake (37.95°N ; 58.32°E) was located near the small village Gara-Gaudan, 25 kilometers southwest of Ashgabat. On that date, an earthquake measuring magnitude: 7.3 Mw on the Richter scale. Surface rupture was observed northwest and southeast of Ashgabat. The earthquake lasted only 10 seconds, but it caused extreme damage in Ashgabat and nearby villages, where almost all brick buildings collapsed, concrete structures were heavily damaged, and freight trains were derailed. More than two-thirds of the people living in the city were killed by the earthquake (the total number of dead were around 110,000). Tectonics of the Kopet Dagh and the surrounding regions. The Kopet Dagh (Turkmen-Khorasan Mountain Range) is a mountain range between Turkmenistan and Iran, extending about 650 km along the border, from the Caspian Sea in the West to the Murghab depression in the East. The highest peak of the range in Turkmenistan is 2,940 m (southwest of the Ashgabat), in Iran is 3,191 m. The city of Ashgabat, the capital of Turkmenistan, lies in the foothills of the Kopet-Dag. The Kopet Dagh experiencing tectonic deformation, accompanied by strong earthquakes reaching and even exceeding seven on the Richter scale. The Kopet-Dagh Mountain is the part of the Alpine geosynclinal belt. The Alpide belt (Alpine geosynclinal belt). 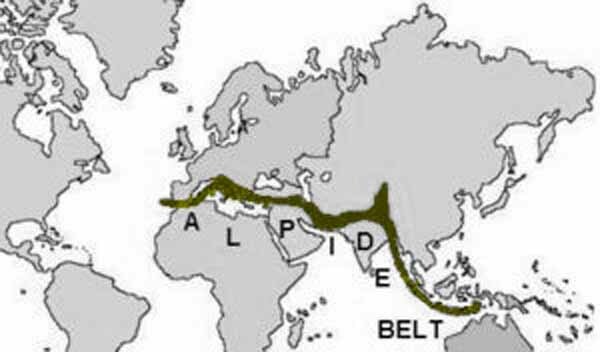 The Alpide belt is a mountain range extends from the southern margin of Eurasia (Atlantic ocean) through the Mediterranean, the Himalayas, the Java and out into the Pacific ocean. This geosynclinal belt includes (from west to east) the Atlas, the Rif, the Baetic Cordillera, the Cantabrian Mountains, the Pyrenees, the Alps, the Apennine Mountains, the Dinaric Alps, the Hellenides, the Carpathians, the Balkan Mountains, the Taurus, the Caucasus, the Alborz, the Zagros, the Kopet-Dagh, the Hindu Kush, the Pamir, the Karakoram, and the Himalayas. The Alpide belt is being created when the Africa, India and the Cimmerian plate collided (from the south) with Eurasia in the north. This collision between the tectonic plates (the Indian plate and the African plate from the south, the Eurasian plate from the north, and many smaller plates and microplates) continues from the early Cretaceous and the Paleocene to Eocene. Currently The process still continues in some of the Alpide mountain ranges including Kopet Dagh. Seismicity of the Kopet Dagh region. Kopetdag is a seismically unique region within the territory of the former Soviet Union. Earthquakes are the most destructive among all the natural hazards. Most of the time, they occur without any warning, which makes them most feared and unpredictable natural phenomena. Globally, on an average two earthquakes of magnitude 8 are known to occur every year. Kopet Dagh is surrounded by tectonically active zones. Earthquakes are regularly felt on all sides of the region, includes Kopet Dagh. As can be observed from Global Seismic Hazard map, Kopet Dagh is one of the most seismic region in the world. 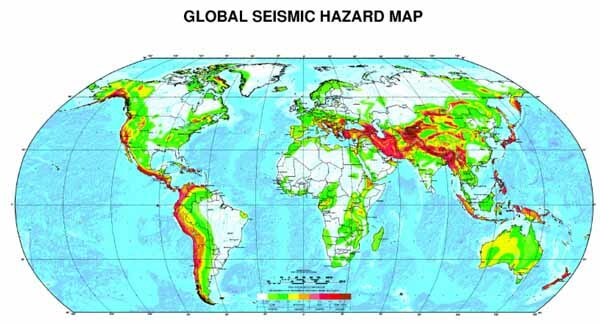 Global Seismic Hazard map (Source: GLOBAL SEISMIC HAZARD ASSESSMENT PROGRAM, Switzerland). 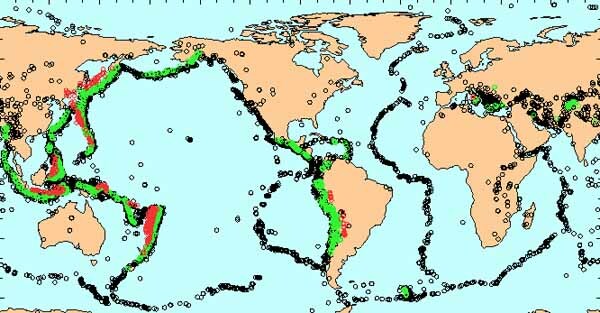 Map of the distribution of strong earthquakes of the Earth in one year. World and Regional seismicity of the region, including the Kopet Dag, for the 1960 - 2013 years. The size of the circles - the magnitude, color - depth. The General Catalog begins from earthquake approximately 2,000 BC, During the period (before 1962) the General Catalog lists 265 earthquakes. 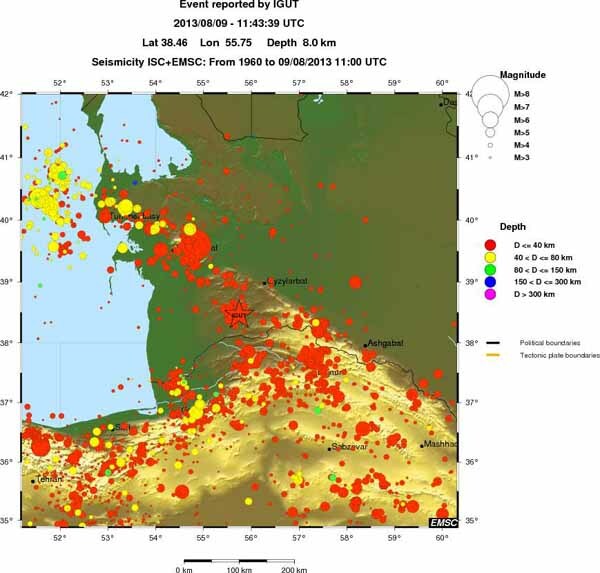 After the local network begins operate, the number of earthquakes in Catalog increased. In General 1,294 events listed in 1962-1990. The central regions of the Asian continent (includes Kopet Dagh) located between northern India and the southern border of Russia, are situated above one of the Earth's many unstable fault lines. At a fault line, the edges of two different tectonic plates meet and grind against one another. Sometimes, a "slip" occurs. The plates shift suddenly, skipping over a shared point of friction before crashing into new interlocking positions. When this happens, the people living on the surface experience an earthquake. Seismicity and seismogeodynamics region, which includes the Kopet-Dag. Ellipses - earthquakes of different magnitudes. Line - tectonic faults; line A-A - Crimea - Kopet Dagh seismic zone (Ulomov, 2008). Spatio-temporal distribution of earthquakes and the phenomenon of migration of seismic activity along the line A-A (Crimea-Kopet Dag (Ulomov, 2008). The Kopet Dagh mountains lie on the southern boundary of the Turan plate coincides with the reverse-dextral Ashgabat fault. The Ashgabat fault on 5th October 1948 was associated with a 7.3 magnitude earthquake. Map of the Global Seismic Hazard Programm (Giardini et al., 1999) + main cities. Peak ground acceleration with a 10% chance of exceedance in 50 years, corresponding to a return period of 475 years. 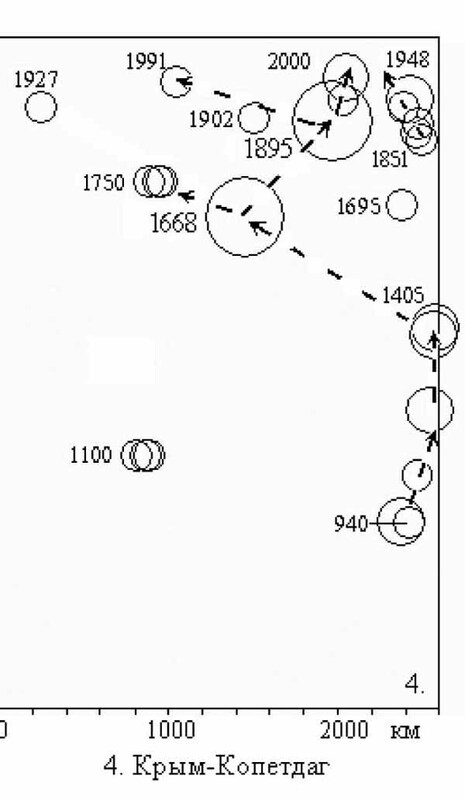 Focal mechanism of seismic events with mb>5. The active deformation of the Turan plate is presently monitored by a dense array of seismological stations in Turkmenistan (Research Institute of Seismology, Ashgabat) and Uzbekistan (Institute of Seismology, Academy of Sciences, Tashkent). Several international databases have also recorded major seismic events on the Turan plate (locations, magnitudes, focal mechanisms). The south Caspian Basin is a relatively aseismic block within the Alpine-Himalayan Belt, but is surrounded by zones of high seismicity. Earthquakes in the Kopet Dag Mountains east of the Caspian Sea also show a mixture of high-angle reverse and strike-slip faulting mechanisms and may be another example of the partitioning of oblique slip into strike slip and thrust motion. The combined effect of the overthrusting of the south Caspian Basin by the Talesh-Alborz Mountains in the south, and by the continental crust of the northern Caspian Sea in the north will lead to the eventual destruction of the south Caspian Basin and the possible formation of an intermediate-depth, dipping seismic zone within the continental interior, similar to that presently observed in the Hindu Kush. 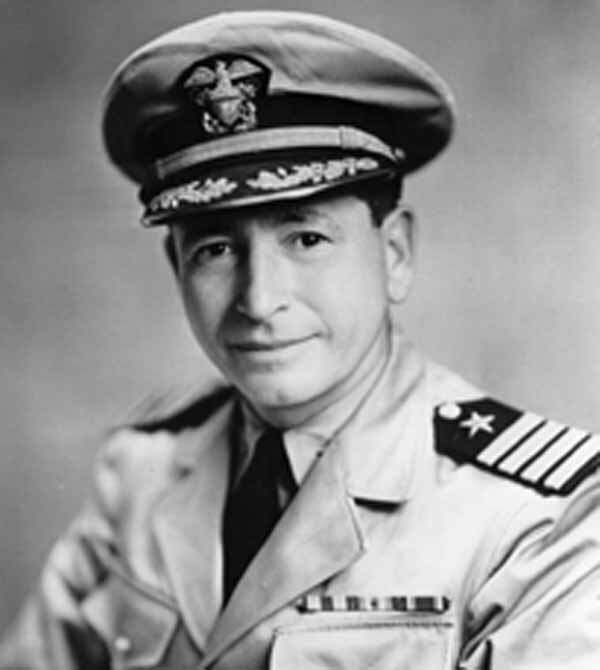 Admiral Ellis M. Zacharias, former Deputy Chief of The Office Of Naval Intelligence, on his radio show Secret Missions (twice, on December 12, 1948, and on September 26, 1949), purported that the cause of the earthquake was the first Soviet atomic bomb test. 1. Earthquake Management in Iran. A compilation of literature on earthquake Management Iranian Studies Group at MIT. 2004. 2. 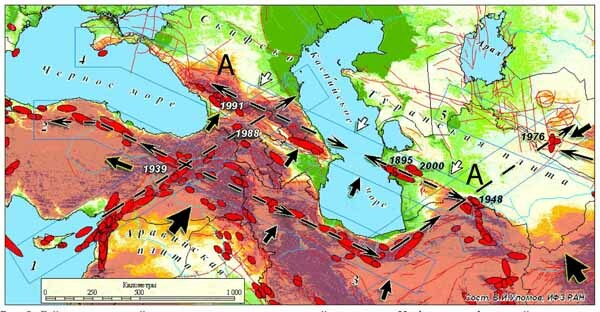 Mirzaei N., Gao M., Chen Y. T. and Wang J, (1997),A uniform catalog of earthquakes for seismic hazard assessment in Iran: Acta Seismol. Sinica, 10 713–726. 4. Уломов В.И. Выявление потенциальных очагов и долгосрочный прогноз сильных землетрясений на Северном Кавказе // "Изменение окружающей среды и климата. Природные и связанные с ними техногенные катастрофы. Монография в 8 томах (Ред. акад. Н.П.Лаверов, коллектив авторов) .Том 1 "Сейсмические процессы и катастрофы" (Отв. ред. акад. А.О.Глико): М.: ИФЗ РАН. 2008, 404 стр. илл. С. 127-146, илл.